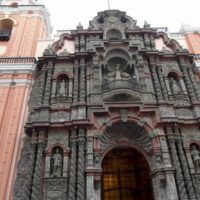 If you start your sightseeing tour of Plaza San Martin and then walk into the historic center of Lima, you will pass the pedestrian area, past many shops, and right next to this probably most beautiful church in Lima, already enchanted by its breathtaking Baroque façade. The church was rebuilt in 1939 according to the original plans from the 17th century. The stunning Baroque main entrance was built in the 16th century from artfully crafted mudbrick and brick. In later earthquakes and fire disasters, it was almost completely destroyed several times and rebuilt again and again. The basilica is a great example of Baroque architecture, and the interior with the artistically designed Baroque high altar and massive columns and folkloric ornate ceiling will also grab your attention. The baroque façade design with many filigree statues, columns, balconies and the large gantries seems powerfully intimidating at first sight. Photo enthusiasts among tourists appreciate the expansive square in front of the church when photographing the ornate main entrance to the church. Since the square is located in the middle of the relatively new pedestrian zone and in one of the business areas of the city, there is often a lot of activity here and one often encounters an accumulation of living statues, which inspire all passers-by with their performances lasting for hours. The walls that decorate the adjacent colonial monastery reflect the life story of the founder of the church, Father Miguel de Orenes. In a nave he lies buried under a plaque. In the middle of the altar is a statue of the patron saint of Our Lady of Mercy. The actual correct and complete name of this beautiful church is La Basilica Menor and Convent of Nuestra Señora de la Merced (Basilica and Convent of Our Lady of Mercy). According to history, the church was built on land previously used by the Brotherhood of Mercedarios. This old monastery was financed by the abduction of stately Christians, for which a high ransom was demanded and mostly paid. The original building from 1541 was built of wood. As there were always fires and destruction caused by earthquakes, the church was rebuilt again and again in the second half of the 18th century.